I’m sure readers of Redmond Pie already know about Find My Friends. 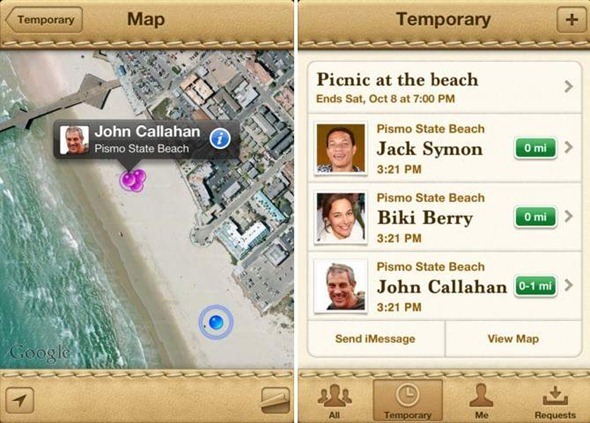 It’s a location tracking app developed by Apple which was released on October 12th alongside iOS 5. I don’t know if it is fair to say this, but Find My Friends is definitely Apple’s version of Google Latitude – an imitation, essentially, of a similar service which all Android smartphones have been offering since 2009. It feels rather odd seeing an innovative company like Apple doing the copying (especially after calling 2011 “Year of the Copycats” in March). The copying done here, though, is not your regular half-hearted stuff: Apple has added some nifty features which sets their location-tracking tool apart from Google Latitude. We’re going to compare the two and decide on which service is a better tool with which you can stalk stay in touch with friends. Before we begin, let’s see what these two apps actually do. Latitude and Find My Friends are both apps which allow you to keep track of where your friends, family and, if they accept your request, co-workers are in real-time. They use GPS, WiFi and even cell towers to track your exact location, which you can share with the people we mentioned in the preceding sentence so that you may keep track of them and then, perhaps, join them wherever they are located. Both apps have similar feature-sets: they allow you to see your friends on a map, share your location to these friends (with custom privacy settings) and do things like calling/texting or getting directions to their location so you can meet up. 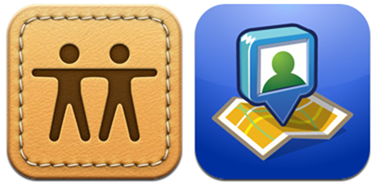 So, at the very basic level, the two apps are the same. However, both apps do have some unique features which differentiate them. Find My Friends is more privacy-conscious and is aimed at sharing with friends and family only, while Google Latitude is for sharing location with a wider circle of people. Find My Friends lets you share location temporarily with a select group of people, turn off location sharing with “the flip of a switch” and even lets you apply password-protected parental restrictions so you can ensure that your kids use the tool safely. Google Latitude, on the hand, is focused more on features: similar to services like Facebook Places and Foursquare, you can check-in (automatically or otherwise) to wherever you’re eating, shopping or just hanging out. Besides this, Latitude is integrated into Google Maps so, once Latitude is activated, it becomes a part of the Maps application (at least on Android) and can be used a “layer” just like Traffic/Terrain etc. With this, you can do things like being able to see Street View and send location to people in your list. This doesn’t mean Latitude isn’t good at keeping care of your privacy. Latitude lets you hide your position from specific people, lets you share location at city-level if you want to (so people don’t know exactly where you are, but still have a general idea) and even choose your location. Latitude for Android, however, lacks in one department and that is: looks. Whether you like the hand-stitched leather handbook look or not, you have to agree that Find My Friends has, overall, a more refined UI. It doesn’t bombard you with seemingly useless options (like Latitude does) and frequently-used actions aren’t more than a couple of taps away. Still, despite its lackluster UI and less-than-satisfactory privacy customization options, Latitude still wins this “battle”. Why? There is one very important feature that Google Latitude has that Find My Friends doesn’t: platform-independency. Yes, Latitude is available not only on Android, but also on iOS, BlackBerry OS and even the aging Symbian OS. Being platform independent means your friends don’t have to carry an iPhone just to use the service (like they have to with Find My Friends) and that is, we believe, the biggest advantage Latitude has over Find My Friends. 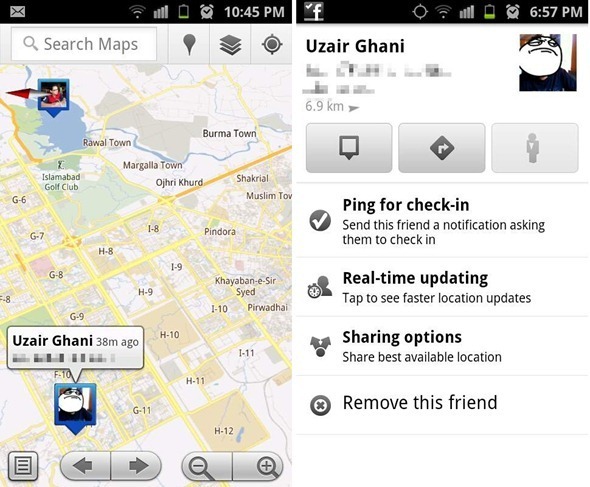 Note: Google Latitude is included with every Android device.